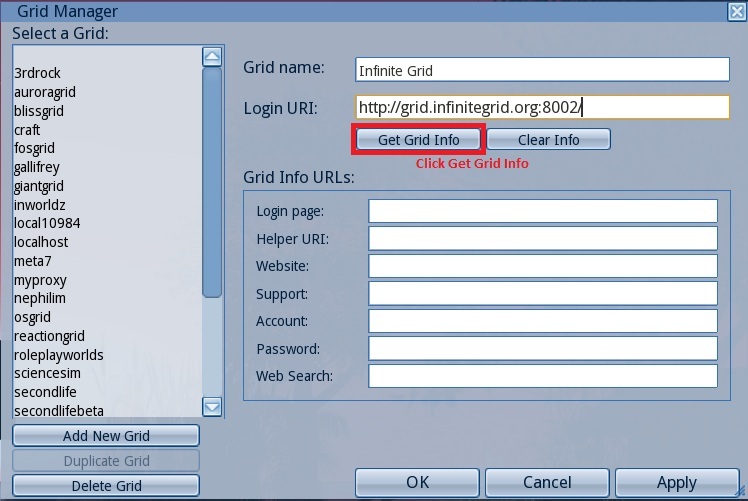 To add the beta grid to your viewer, use a Grid name of "Infinite Beta", and a Login URI of "http://grid.infinitegrid.org:6002". So you have a viewer with no "Grid Manager" built in to the viewer so, I had to edit the "grids.xml" file to add IG to the long list of supported grids. I will include the edited .xml file in this post, as well as instructions on how to do that. This is only for Windows, as far as I am aware and I have it working perfectly, for me, on Windows 7 (x64). 1. Download the "grids.xml" file from grids.xml and save it to your desktop. Then, right-click and copy the "grids.xml" file and paste it into a folder on the desktop to backup the file. 3. Click the start button or Orb and type Run in the search. 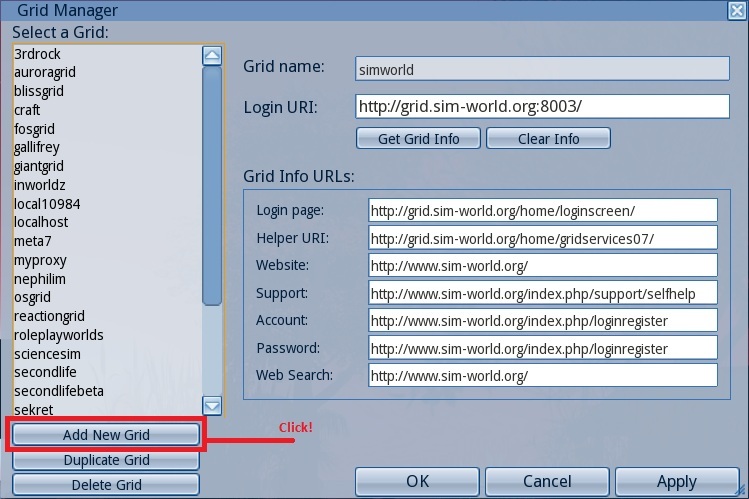 DO NOT close the window that is open - Simply, right-click the "grids.xml" file on the desktop and click copy then, right-click in the Window you have open and click "Paste". Windows will ask you if you would like to "Copy & Replace", select that option, then close the window by selecting "Cancel". If you try to overwrite the "grids.xml" file, any other way, Windows will not allow it. 5. 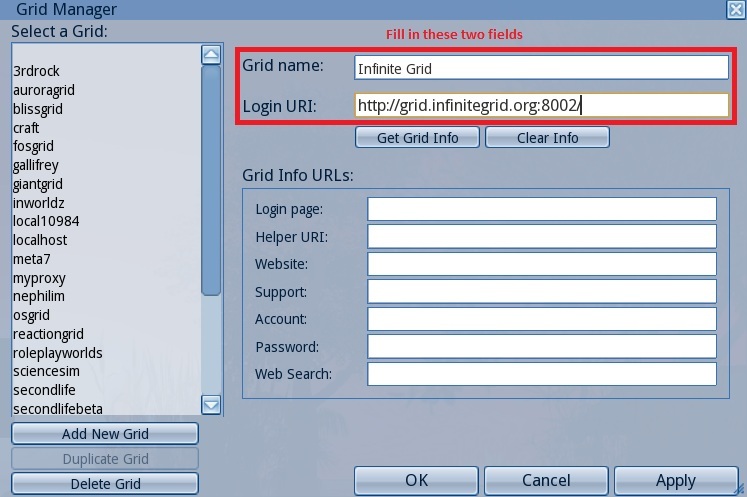 Run your Viewer, select InfiniteGrid from the dropdown, fill in your login details & Login. 6. Enjoy & Have fun! Also, this modified "grids.xml" file DOES NOT work for the old Meta7Viewer! install your m7-viewer like any other viewer, then go to your desktop, look for the shortcut to the m7 viewer, rightclick it and open the properties! then put "-loginuri http://grid.infinitegrid.org:8002/ -loginpage http://webfront.infinitegrid.org/loginscreen.php" into the target behind the actual target (should look like "C:\program files\Meta7Viewer\Meta7Viewer.exe -loginuri http://grid.infinitegrid.org:8002/ -loginpage http://webfront.infinitegrid.org/loginscreen.php") without the brackets, mind! then press ok and start your m7 viewer, log in and enjoy your good old sight on the new grid!